Thejv16 PowerTools was designed to be a full Windows optimization utility suite containing 27 different main tools. Each of these tools is carefully crafted with the experience of 10 years of extensive Windows utility and registry cleaning experience to form a solid foundation to a smoother and faster system. 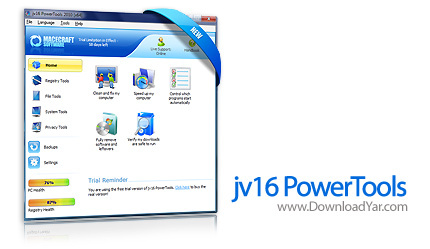 jv16 PowerTools allows users to remove all traces of previously uninstalled software, to clean the computer's Windows registry for optimal performance and stability, and to fix many registry-based problems with a single mouse click. - Instantly make your Windows run faster and smoother, by disabling certain features which have no useful function and by modifying a few key aspects of the system's behavior. - Automatically clean your Windows registry from obsolete and unneeded data. - Automatically fix many kinds of registry errors, such as broken file references. - Easily uninstall leftover traces of software you have thought you have already uninstalled ages ago. - Detect and remove unneeded history data and MRU (most recently used) lists that can contain sensitive information about you. - Locate and delete unneeded files, including temp files and duplicate files.